My newest SCOBY is Tibicos, or water kefir. I am loving water kefir because it is relatively fast, it makes a nice milder brew that tends to be easier on the belly than kombucha, and it is very versitile. 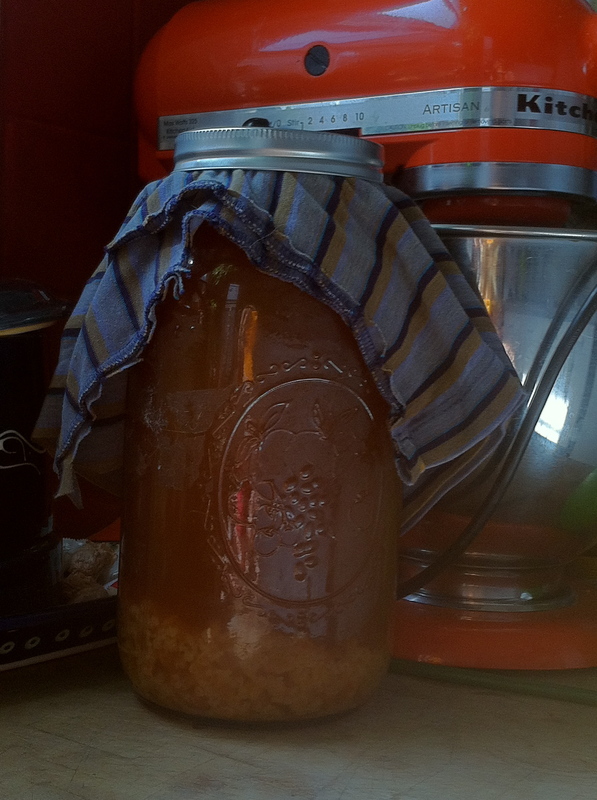 There are many variations on this recipe, but here are some starter instructions for water Kefir. I adapted this recipe from yemoos.com, which is a great resource but also a little overwhelming. 1. Obtain the tibicos culture. I “adopted” mine from a lovely site called yemoos.com. If you live in NYC, you could adopt one from me. 4 cups water filtered or spring water is best– if you use tap water treated with chlorine, then you should let it sit out for a day to let the chlorine evaporate. 4-6 T (about 1/4 c) of sugar. White, brown molasses, whole cane, or maple syrup all work well. 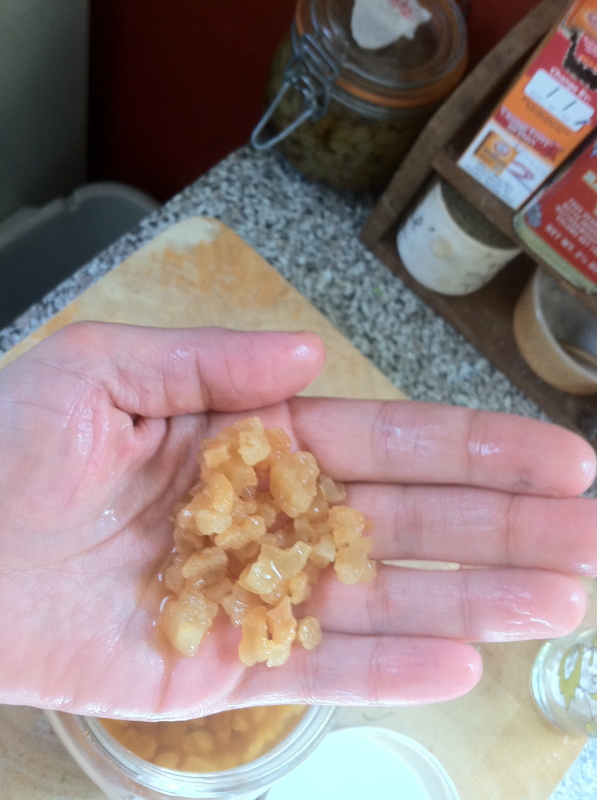 Tibicos needs both sugar and minerals, so if you use all white sugar, you should definitely add some dried fruit. small handful of dried fruit (optional). The fruit adds flavor and provides the culture with minerals as well as sugar. Dried apricots and raisins work particularly well. Make sure that the fruit is unsulphered. a wedge of lemon (optional). Lemon can help balance the pH of the fermentation. If you are having a hard time with your culture or waking it up after a period of dormancy, you would do well to add the lemon. Make sure it’s organic, or if it’s not, then take off the rind. Don’t squeeze the lemon, just put it in. It will slowly release it’s stuff into the culture over time. 3. Stir it all up. It is helpful to do this a couple times a day, but not essential. 4. Cover with a cloth, so the culture can breathe but so flies and dust can’t get in. My latest batch brewing. Note: this is not the basic recipe, so it’s darker than this recipe will look, and I’m doing a double batch here (2 quarts). 5. Wait 2 days. Then taste it. If it’s too sweet for your liking, leave it another day. It should be milder than kombucha, but it often takes on an almost bitter flavor. 6. Strain it. I use a metal tea strainer on top of a funnel, and strain it straight into the bottle I’m going to use. Beware: tibicos will corrode metal if it stays in contact with the metal for a long period of time, so I’m always quick to clean the strainer straight after this step. Once you’ve done this, your grains are free to start a new batch. If you don’t start a new batch right away, store your grains in the fridge mixed up with some sugar water. They should keep well for about a month. 6. Bottle it. I like to use Grolsch beer bottles, or glass screwtop bottles from seltzer water or wine. Leave the bottled brew out at room temperature for another day to allow it to build up some bubbles. If you dare, leave it for two. If you leave it too long, then the bottle will explode when you open it, and you’ll end up with a mess+ only half of your brew.